The system controls work by squeezing the spring loaded smaller diameter bar inside the handle slightly. The up and down movement controls the contraction of the main tube. Most people use a combination of there fingers and thumb. 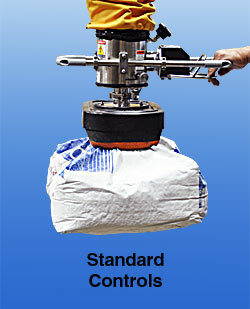 This design offers fast handling and attach and release with a trained operator. Controls include an adjustable ‘Load’ and ‘No-Load’ valve on the control box itself to allow for precise positioning of specific weight loads. FDA Compliant using FDA approved materials for washdown environments. Ergonomic lever control handle is spring loaded requiring the operator to keep a hand on it during operation. Very easy to clean and service. Front cover screws off to expose mechanism when cleaning is necessary. It is a rugged construction. All ANVER VT Vacuum Tube Lift Systems use the same basic operating principle: a remotely connected vacuum pump produces a vacuum in the lifting tube and control head. As the control head and pad attachments are placed on the object to be lifted, the pads seal upon the object and the vacuum in the lift tube increases, causing the lift tube to contract, raising the load. As the vacuum (controlled and regulated by the operator using the control handle) is decreased, the lift tube extends, lowering the load. A simple, reliable means for a single operator to effortlessly handle virtually any load. ANVER VT Vacuum Tube Lifters can now be equipped with a pneumatic release & lift assist valve: Model VT-RLV-M for the Mini series VT vacuum tube lifters and model VT-RLV-S for the Standard series. 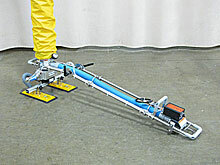 The VT-RLV-M/S valve, when used with a VT Vacuum Tube Lifter equipped with ANVER’s CA Compressed Air Assist option, can aid in the release of an attached load and lifting of the vacuum tube lifter and pad attachment off the load when the lift tube is in its nearly fully compressed state. This is useful such as when stacking loads above head with an extended length handle is a requirement. The operation of the vacuum tube lifter for attaching and lifting the load is the same as for a vacuum tube lifter without this option. However, with a standard tube lifter, it is necessary to tilt up the pad attachment to break the vacuum seal in order to release the load. With an extended length handle and a nearly fully compressed lift tube (encountered in high load stack height operations), this can be difficult to accomplish. The pneumatic release & lift assist valve option simplifies this step and eliminates the need to tilt the pads to break the vacuum seal. By twisting and holding the VT-RLV attach/release knob, the vacuum seal on the pads is broken, the load is released, the lift tube compresses, and the lifter rises up off the load. Once the lifter is clear of the load, releasing the selector switch allows the tube lifter to be lowered to its normal working height. All ANVER VT Vacuum Tube Lifters can be equipped with a release assist valve, model VT-RAV-M-CV for the Mini size lifters and VT-RAV-S-CV for the Standard size lifters. The VT-RAV-M/S-CV valve will aid in the release of any load, and is especially useful when handling loads that require extra effort to break the vacuum seal when attempting to release the load. The VT-RAV-M/S-CV is recommended for use with multi-pad vacuum tube lifters equipped with articulating extended length handles. The operation of the lifter for attaching and lifting the load is the same as for a standard lifter without this feature.To release the load, once the load is in its release position, fully depress the control lever, and tilt up the pad attachment to break the seal. If the seal cannot be broken in this manner, pull and hold the RED release knob while holding the control handle down. Once the seal is broken, and the load is released, release the control handle and the RED release knob, and the lifter will rise up. 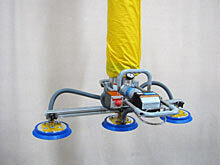 Once the lifter is clear of the load, reposition the vacuum lifter to its working height. ANVER VT Vacuum Tube Lifters can be supplied with an internal compressed air line to provide an auxiliary source of power to the tube lifter control head. When connected to a source of clean, dry compressed air with a recommended maximum of 90 psi, the air line outlet at the tube lifter control head provides pneumatic power that can be used to assist in load handling by powering vacuum head attachments such as venturi vacuum generators, pneumatic rotators and tilters, or to actuate a valve to close off vacuum flow to the vacuum pads and assist in releasing loads in high stacking applications. The CA Compressed Air Assist option, available for all VT Vacuum Tube Lifters, must be incorporated in the assembly at time of order and is not available in kit form as an add-on. For ordering purposes, simply add -CA to the end of the Top Swivel, Control Head and Tube Assembly numbers found in the Lift Tube Assemblies and Parts Chart. Custom and standard vacuum lifting attachments are available from our extensive inventory of vacuum attachments for boxes and cartons, bags and sacks, sheet, coils and rolls. Contact the factory or your ANVER dealer for further product information. The internally coiled air line is rotary coupled to the tube lifter top swivel to provide full, unimpeded 360° rotation of the lift tube. The air outlet port is compactly located on the left side of the tube lifter control head. The internal air line, with no exposed lines between the top swivel inlet and control head outlet ports, permits unimpeded operation of the vacuum tube lifter with no adverse effects on the tube lifter’s operation or lifting performance. Contact ANVER for help in choosing the appropriate tube lift system for your requirements. Replacement parts are available from stock. Call us and see why our quality, service and prices set the standard in the industry. For proper standard operation see ANVER VT System User’s Guide + Safety Instructions Doc. No. : 12000002.